Genealogists at Family Tree DNA are now using DNA research to find connections between Jordan famlies in North America and Europe. 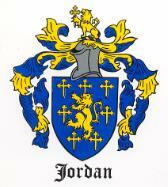 The buttons below will take you to the Jordan Surname DNA Project description, forms, results, etc. This web site will not publish any information that will directly tie any testing results with any living individual. This policy will hold even though there is little to no impact to be found from having these numbers published. Click here if you are having problems with menu/text overlap on the screen. The following buttons provide information about other DNA research and surname projects.